Hannah Holman, cellist, joined the New York City Ballet Orchestra at the beginning of the 2012-2013 season. Her career has encompassed orchestral and chamber music, solo performances, and teaching. In a review of the second CD she recorded with pianist Rene Lecuona, Fanfare magazine declares "her tone and technique are the stuff that cello legends are made of "... Holman's cello sings with a lustrous tone that's hard to resist." 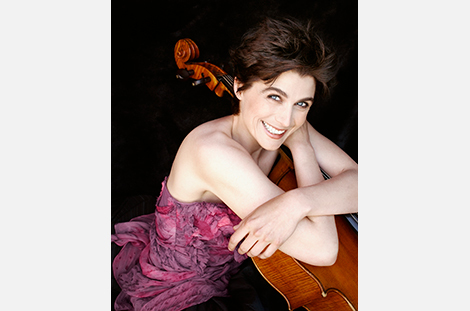 In addition to her work with the New York City Ballet Orchestra, Ms. Holman is the principal cellist of the Quad City Symphony, a position she has held since 2008. She began her professional career in England playing with the English String Orchestra under Yehudi Menuhin and the City of Birmingham Symphony Orchestra under Simon Rattle. Her previous orchestral work also includes serving as assistant principal cello with the Michigan Chamber Orchestra, the Richmond Symphony; and the American Sinfonietta. An active chamber musician, Ms Holman helped found Trio 826, with her dear friends Susanna Klein, violin, and Julia Bullard, viola. She was a founding member of the Beaumont Piano Trio, which performed around the United States and England, and was also a founding member of Quadrivinium, a music ensemble in residence at the Virginia Museum of Fine Arts. From 2002-2011, she was a member of the Maia Quartet, the University of Iowa's quartet in residence, which toured China, Japan, and throughout the United States, including teaching residencies at Interlochen Center for the Arts, the Great Wall International Music Academy in China, and the Austin Chamber Music Center. She regularly performs in chamber ensembles with musicians from throughout the United States. As a soloist, Ms. Holman has performed with orchestras in Michigan, North Dakota, Minnesota, Virginia, Georgia, and Iowa. A dedicated private teacher who finds great fulfillment in helping students of all ages grow musically, Ms. Holman was on the University of Iowa music faculty from 2002-2012, and has served on the faculties of the Worcester College (UK), Michigan State University Community School, and Virginia Union University. She has participated in numerous festivals, and has been on the faculty of the Eastern Music Festival since 2001 and currently serves on the faculty of the International Cello Institute. Ms. Holman studied at the Eastman School of Music and Michigan State University, where she completed her Bachelor of Music degree. She obtained her Master of Music Degree with Fritz Magg at the New England Conservatory. Hannah was fortunate enough to have several lesson with William Pleeth in London as postgraduate study. Her musical education began at age 5 with her grandmother, whose 1925 Becker cello she plays today. She is eternally grateful for the fine teaching of a transformative teacher, Louis Potter, during her junior high and high school years. Ms. Holman - whose hobbies include food, wine, and finding killer deals on shoes - divides her time between NYC and Iowa City, Iowa, where she lives with her son, Matisse, and their cat, Ripley.